THPBlog: Campbell Timberlands to log on steep and unstable lands near the Skunk Train Railroad and the Noyo River. Campbell Timberlands to log on steep and unstable lands near the Skunk Train Railroad and the Noyo River. THP 1-13-093 MEN (Twin Bridges Yellow THP) Campbell Timberlands, 223 acres; 47% selection, 24% sanitation salvage, 21% variable retention, 9% clearcut logging. Duffy Gulch, Little N. Fork (MD: T18N R16W Sec.1, 2, 3, 4, 9, 10, 11, 12). Winter operations, high erosion hazard, steep slopes up to 80%, road failure sites, landslide terrain, 121 road drainage work sites, impaired 303.d watershed, herbicides, coho watershed, 10 spotted owls within 1.3mi, trees over 50" dbh. Estimated public comment deadline: 11/14/13. This THP is about 9 miles east of Fort Bragg, CA near the Skunk Train railroad route (adjacent to unit Y) and the Noyo River at an elevation of 260 to 1560 feet. 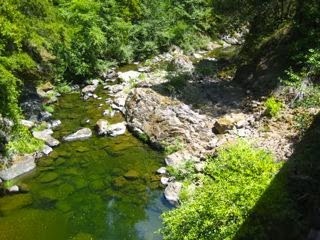 The THP area drains into the Noyo River which is listed as impaired for temperature/sediment and is an important steelhead, coho and chinook fishery. Campbell Timberlands is planning a tractor and cable logging operation on steep and unstable slopes in redwood, Douglas fir, western hemlock and grand fir forests. There is landslide terrain in units B,H,L,M,T,W,Y and Z including 8 landslide sites related to debris slides, road failure sites and active and dormant landslides. Campbell Timberlands wants to use tractors on steep slopes over 65% in units T,W and Y, and on steep slopes over 50% with a moderate or high erosion hazard in units B,T and Y. They also want to use an existing tractor road in streamside areas in units B,T and Y, and use 2 existing landings in streamside areas in unit T, and a landing in unit Y. 120 road drainage sites are planned for work including rocking, dip construction, culvert repair and replacement and road bed re-construction. This THP will result in the loss of 3.8 acres of foraging habitat within .7mi for spotted owl site MEN0082, and the loss of 13.8 acres of nesting/roosting habitat within .7mi for spotted owl site MEN0082. 2.5 acres of nesting/roosting habitat will be removed from spotted owl site MEN0014 within .7 mi, which is already deficient in total NSO habitat. More information is available on the THP Tracking Center website.